The 9 month update. A little behind. So, I know Will is almost 10 months old now, but here’s the 9 month news anyway. He is crawling on all fours instead of army crawling, and he cruises on everything. He LOVES bath time, and regularly tries to climb in the tub if I don’t keep the bathroom door shut. He is quite a cuddly guy and would happily be held all day. In fact, often when I set him down he’ll crawl after me crying pathetically until I pick him up again. He doesn’t do this to Brian, of course. He is also sleeping MUCH better (through the night most nights) and I’ll definitely be posting more about what we did to encourage that. Also, he is FINALLY getting a tooth! (Or teeth maybe, can’t be sure.) You can’t feel it yet, but you can see the spot on his gums where they’re about to come through. I’ve been a huge slacker with the picture taking, mostly because I didn’t want to take pictures where the background was a mess of stuff that still needed to be unpacked and put away. But I did take this picture because I think it’s crazy how much these kids look alike in these photos. 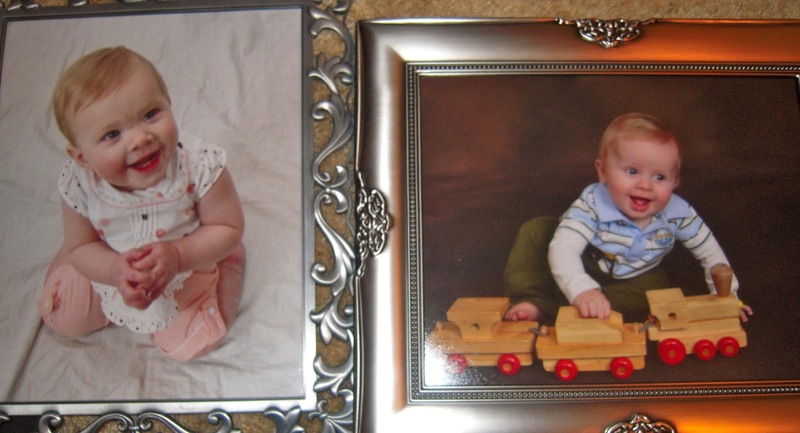 That’s Kalena at nine months (that’s the way it got packed up and I haven’t updated it yet) and Will at nine months. I don’t think they look too much alike right now, but I definitely see it here. What do you think? That's so crazy that I don't think they look alike, but somehow in those pictures they really do! That's cute that he's a mommy's boy. Not a mama's boy, but that he loves his mom. 🙂 Also, they totally look alike!! That's crazy! I love how they both have the same smile! Super cute photos! Eli's doing the same crawling-after-me-crying thing. I ignore him as much as possible to discourage it, and shoo him off to play with Patrick. I don't know that Patrick is actually a big fan of playing with Eli right now, but HE is a mommy's boy and doesn't want my wrath, so he obliges. Both kiddos are getting even cuter with age! If this trend keeps up, we'll have to shield our eyes from the cuteness in a few short years.